I have a short break from classes, and wanted an excuse to make some stuff. Welcome to the Heart Jam! The theme is: Heart. Hearts are a common symbol in games, and I'm interested to see how people implement and reinterpret it. Props to @nefarious_vix for the suggestion! How you choose to approach the theme is entirely up to you. Make it your main focus, or just a minor reference, your choice. The jam will go for the first few days of April, basically until my classes start again. Feel free to start planning before the Jam starts, but please don't actually start creating until then. This is an honour system, I won't exactly be checking. This is not a contest, just a chance to make and play some fun games. Game length and quality is unimportant, but also it doesn't have to be a game! Any interactive experience is allowed, don't shy away from a Twine piece (for example) just because you think it's "not gamey enough". You are welcome to submit non-games, such as pieces of writing or art/audio assets if you wish. Work individually or as part of a team. I highly encourage you to make a new project to submit rather than submitting an existing one, but I won't turn away any submissions. Unless they're super-offensive or something. Rather than cluttering up the Jam description, here's a link to a bunch of resources to use, including some aimed at beginners. If you're not sure how to begin or you have any questions or comments, feel free to contact me here or on Twitter (I'm @ZombieHam). 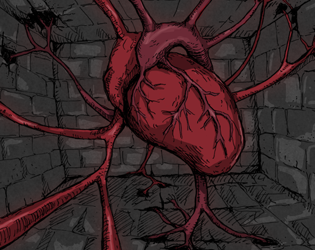 A game created for https://itch.io/jam/heart-jam and https://itch.io/jam/weekly-game-jam-38.